When you think hiking, the Netherlands might not be the first country that comes to mind. It’s true there are no great mountains to scale here but there are beautiful paths through the Dutch countryside and recently I’ve started exploring them. 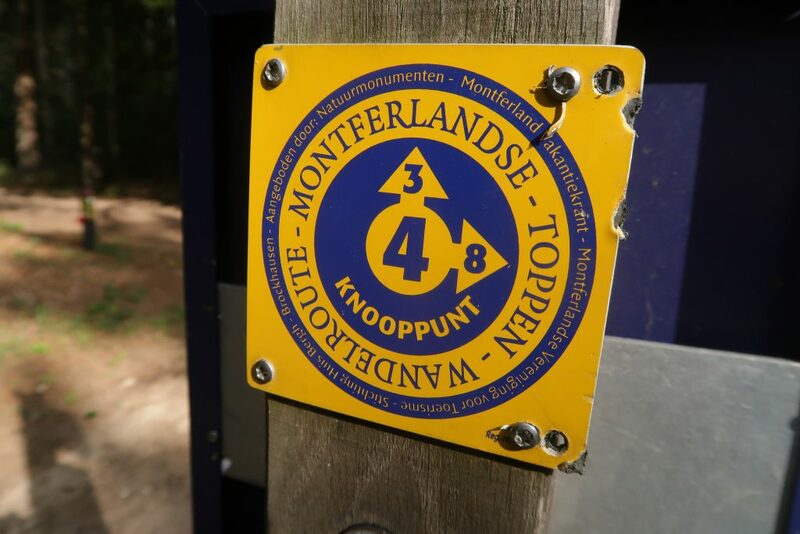 Together with friends, I set aside a few weekends a year to go walking.. Last weekend we tackled the Montferlandse Toppen Route: 43km of paths running through the woods in the Achterhoek region. The Monterflandse Toppen Route is well signposted. This route covers 18 ‘peaks’ in the region. None are very high but each has its own story, and is marked by a QR code so you can read about the history as you walk. And uniquely, the route is not a linear line. It’s actually a set of paths marked with numbers, which you can combine to make the route as long or as short as you want: handy! Based on our experience, here are a few tips. We started in the lovely German village of Elten. If you want a bakery or a nice place to have lunch, you’ll find it here. There’s a pancake restaurant “high up” in the hills of Elten (on the trail). The service was slow but the pancakes were delicious. In town are a few traditional German eateries. Uniquely for Germany, the bakery is open on Sunday. They will make sandwiches to order for an easy and packable lunch. We were happy to have lunch with us. Although you are never very far from a village if truly needed (it’s the Netherlands, after all), it’s also possible to wander for a few hours without seeing much. There are not as many cafés on the route as we’ve experienced on previous walks, so do take a sandwich or some snacks. If you do want a coffee, the trail takes you straight past a nice little restaurant with terrace (and public bathrooms) in Beek. There’s also a nature playground for the kids here. The town of ‘s-Heerenberg is another good stopping point, with plenty of shops and a castle to visit. We ate here at the Forest World Restaurant (Wereld Restaurant Forest). In general I’m not a big fan of all-you-can-eat places but I have to admit that the staff were very friendly here and accommodating of special diets. One person in our group has a gluten allergy and they had no problem making a separate meal for her. There was lots of variety and we enjoyed our meal here. As you hike, you’ll come across a few towers giving great views of the countryside. Mostly you’re in the woods but there are also some nice sections crossing open farmland. All in all a great weekend away. Recommended! 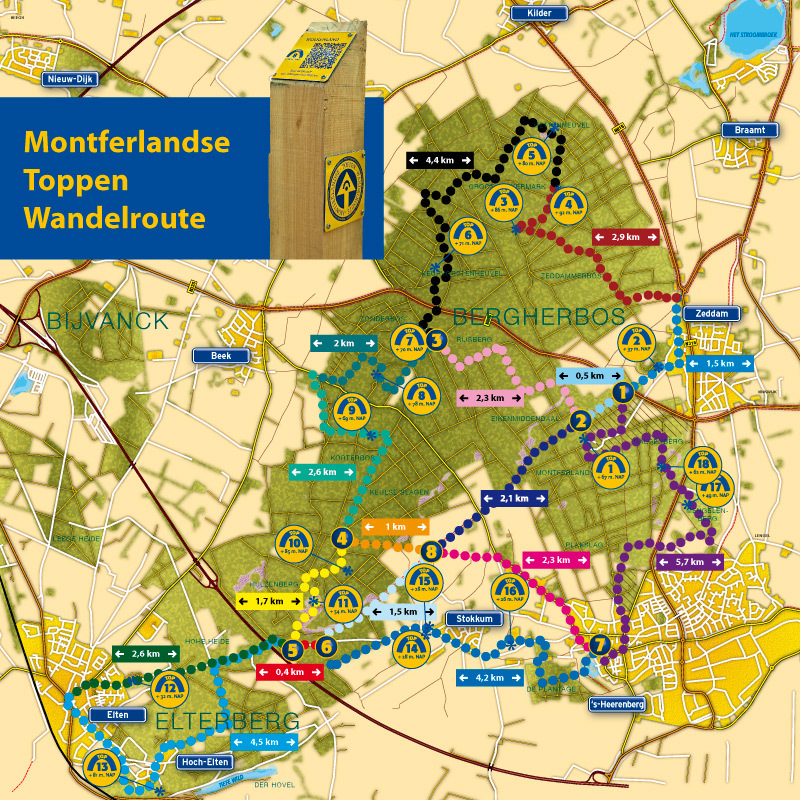 The map of the Montferlandse Toppen Route. Public Transport – Getting here can be a bit of a challenge if you don’t have a car. We were lucky to have a lift from friends but otherwise Beek-Elsloo station is nearby. You can also travel to Doetinchem and get a bus from there. GPX Track – A GPX file for one variant of the route can be downloaded here.